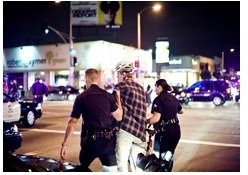 Cyclists on a Saturday night bike ride through mid-city Los Angeles incurred the wrath of the LAPD and ended up detained, handcuffed and cited for infractions that included riding a bicycle without a bike license and carrying a driver’s license with an out of date address. According to LAPD Information Officer Anna Aguirre, the incident began when they received a call of "assault with a deadly weapon" at 3rd and La Brea. Officers responding to the call encountered approximately 100 cyclists in the Ralphs parking lot and called for "all available units." The deadly weapon turned out to be a motor vehicle and the victim turned out to be a cyclist. LAPD officers interviewed the motorist and the cyclist and determined that no crime had been committed and allowed the motorist to leave. At the same time, supporting LAPD officers and their supervisor began detaining arriving cyclists still in the street, handcuffing them and ultimately issuing the tickets that critics hold up as evidence of harassment. In January the City Council declared a moratorium on the enforcement of LA's bike license law. This action followed a Police Commission recommendation a month earlier to immediately enact a moratorium in the enforcement of LA's bike license law, an action that followed a report from Police Chief Bratton recommending the repeal of the law because it was ineffective and outdated. Bratton goes so far as to say "Given our continued efforts to deploy all available sworn personnel to field operations in direct support of our crime fighting and community policing efforts, reviving the bicycle licensing program at this time is not prudent." None of which seemed to matter to the Officers who now had several cyclists in handcuffs and were busy cutting the backpack off the back of a cuffed detainee as he lay facedown across the trunk of a police car. A cyclist on the other side of the intersection secured his bike and began photographing the incident on foot from different vantage points. He then crossed the street, earning a pair of cuffs and a ticket for crossing "against a circular red," a violation typically reserved for motorists, not pedestrians. The photographer, bike activist Alex Thompson, took his photos and his ticket to the Police Commission this past Tuesday and leveled a charge that the responding LAPD officers detained cyclists in handcuffs and then stretched their imaginations to come up with citable offenses, all without probable cause. The Commission immediately turned the case over to the Inspector General. As of this past Wednesday, Captain Davis, Commanding Officer for the Wilshire Area, has released a statement that indicates in part " With regards to the citations for no Bike License, the "No License" section has been canceled. And, in the spirit of the law the entire citation for the two violators will be canceled. The policy for the moratorium on bike licenses has been discussed with my command. This is a lesson learned, your cooperation and understanding on this matter is appreciated." Critics of the incident claim that canceling the tickets fails to answer some significant questions including 1) on a Saturday night in LA, is it really a priority to herd cyclists off the street? 2) how does a City Council, Police Commission and Police Chief directive calling for a moratorium on the bike license law get missed by so many LAPD officers and supervisors? 3) why are the responding officers working so hard to find infractions that they will handcuff a cyclist and spend 15-20 minutes looking up obscure and unenforceable code? The LAPD's position, according to Watch Commander Sgt. Pickett and Information Officer Aguirre, is that the LAPD received reports of traffic violations, alcohol use and other violations by the cyclists on the street that night and that they were just responding to complaints. Cyclists countered this claim by challenging the LAPD to cite those who violate the law, not simply anyone riding a bike. As for the charge that the handcuffing of the detainees was an extreme and unnecessary tactic, apparently it's the Officer's discretion to use handcuffs "to maintain safety and control." Unfortunately, no records are kept so there is no way of analyzing or evaluating the use of restraints by officers, by area, by incident or any other criteria.